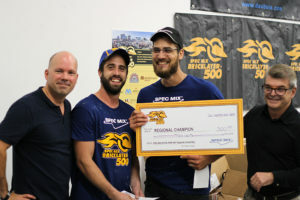 Montreal – The 2018 SPEC MIX BRICKLAYER 500® Quebec Regional Series has come to a close and mason Steve Thibault and mason tender Kevin Muraca of Atwill-Morin in Montreal, Quebec won it all. Now they head to Las Vegas to compete in the SPEC MIX BRICKLAYER 500 World Championship next January at the World of Concrete. École des métiers de la construction de Montréal hosted the regional series event, one of 24 being held across North America. The qualifying national competitors will battle for a chance to win over $125,000 in cash and prizes, including a Ford F250 XLT 4X4 truck and John Deere Gator. SPEC MIX TOP CRAFTSMAN, which goes to the team with the “most sellable wall,” went to mason Timothy Ross Wilson and mason tender Jeremy Lacasse of MF Construction in Chateauguay, Quebec. For this honor they received $200 each. 2nd place went to mason Gabriel Legault and his mason tender Maxime Legault of Maconnerie Legault in Gatineau , Quebec with a brick count of 404 earning them a prize of $150 each. Third place went to mason Timothy Ross Wilson and his mason tender Jeremy Lacasse of MF Construction, Chateauguay, Quebec who received $100 each. The SPEC MIX BRICKLAYER 500® was established by SPEC MIX in 2003 to showcase the skill and craftsmanship of professional masons. It is featured as the headliner event of MASONRY MADNESS™ Day during the World of Concrete and recognized as the masonry industry’s premier bricklaying competition with a total purse estimated at $125,000 that annually awards the title, “World’s Best Bricklayer”. 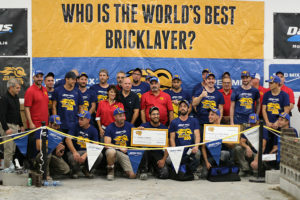 Each year there are a series of preliminary SPEC MIX BRICKLAYER 500 Regional Qualifying Events held throughout North America to determine who will compete in the SPEC MIX BRICKLAYER 500 World Championship. The Championship finale draws as many as 4,000 spectators with thousands of live webcast viewers who tune in to watch this bricklayer battle. More about SPEC MIX®: SPEC MIX is the construction industry’s national source for high quality; factory preblended cement-based building products for the construction industry. With more than 60 manufacturing facilities in all major markets across the US and Canada, SPEC MIX production plants utilize state of the art batching equipment and the finest materials to ensure total quality control throughout your project. SPEC MIX offers a deep line of masonry mortars and grouts, stucco and industrial products including various patented silo systems to maximize a contractor’s productivity and safety. The mission of SPEC MIX is to keep your jobsite team going, moving and working safely—all day, every day. NOTE USE OF TERMS: Please respect all legal trademarks for trade use. In print, the correct way to refer to the competition event is the SPEC MIX BRICKLAYER 500® World Championship, and MASONRY MADNESS® or MASONRY MADNESS® Day, case use as shown. The award titles for SPEC MIX TOP CRAFTSMAN, and SPEC MIX TOUGHEST TENDER®, should be in all caps followed by the word, “award.” When writing about our corporation the correct way to write our corporate name is SPEC MIX®. If referring to SPEC MIX brand the correct way is SPEC MIX®. The ® mark should always be used on the SPEC MIX BRICKLAYER 500®, and SPEC MIX® the first time either term is used in body copy and always used when either term is in a headline or sub-headline. The same is correct for MASONRY MADNESS® or MASONRY MADNESS® Day. If any of these title terms are used for mass media news or editorial use, we ask that the full term be used at least once at the beginning of the article, thereafter, “event or competition” would be acceptable terms. Please do not cut, rename or edit the legal trademarked name of the event so as to maintain the legal brand name and its integrity.